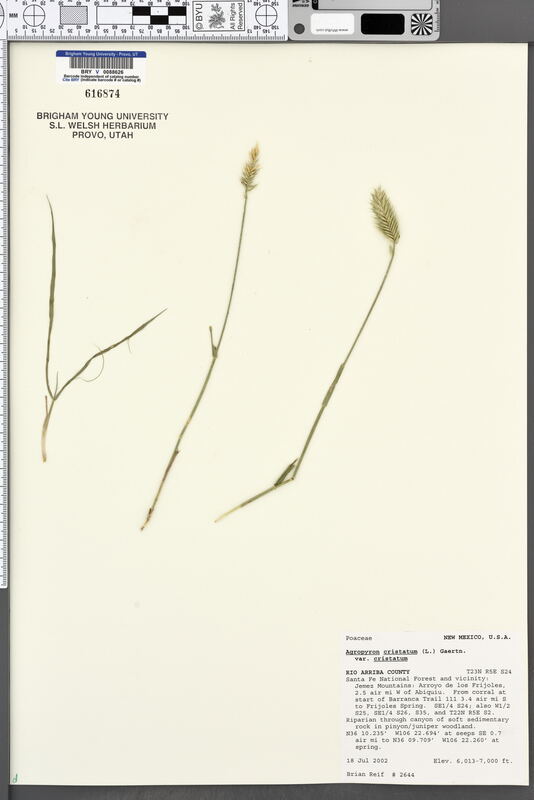 Taxon: Agropyron cristatum var. cristatum (L.) Gaertn. Locality: U.S.A., New Mexico, Rio Arriba, Santa Fe National Forest and vicinity: Jemez Mountains: Arroyo de los Frijoles, 2.5 air mi W of Abiquiu. From corral at start of Barranca trail 111 3.4 air mi S to Frijoles Spring. SE1/4 S24; also W1/2 S25, SE1/4 S26, S35 and T22N R5E S2. Verbatim Coordinates: 36.17058 N 106.371 W /// T23N R5E S24 .